Admiral Allen helped with the release of some of the rescued turtles from the Gulf today before giving his press conference at Cedar Key, in Florida. He noted that while there has not been any final decision yet on what to do best in moving closure of the Deepwater well forward, some steps in that process are happening. For example, the Blowout Preventer (BOP) from Development Driller II (the second relief well) is going to be needed at some point to allow drill pipe to be inserted into the Deepwater well, so that a top cement plug can be inserted. To that end the BOP transfer is now being expedited. At the same time the Q4000 and the Discovery Enterprise are being brought back over the well, for several purposes. Initially these will be used to flush other fluids from the BOP, the production casing and any other accessible volume within the well. (Note that this will likely not include the fluid trapped in the annulus since there is no easy way to displace this). Once the volumes have been cleared the fluid used to sweep them will be replaced with seawater, emulating the condition when the BOP is removed. By monitoring the pressures in the well during this process, and with the necessary safety valves in place, this will assure the scientific panel, and the Admiral, that removing the BOP and stack won’t cause a problem. Hopefully by doing this, among other things, it will resolve the problem of the slow bleedoff in pressure that has been occurring within the stack during the current testing process, but which is blamed on the escape of trapped gas. They will then decide whether to install the new BOP before completing the relief well. Since, in other words, nothing much has changed, let me go on to look at the new “This Week in Petroleum” which came out today. As the adverts on television and the newspapers will tell you, summer is coming to an end, and school sessions are about to restart. Which means that we are coming to the end of the summer driving period and, as a result, demand will, likely in a couple of weeks, start to decline. 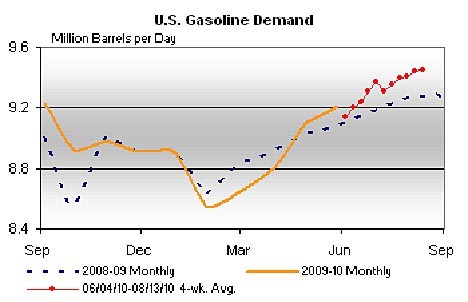 As the latest TWIP (This Week in Petroleum) notes, we aren’t quite there yet, and demand is running some 250,000 bd above last year , for gasoline, but we are close to the turnover. 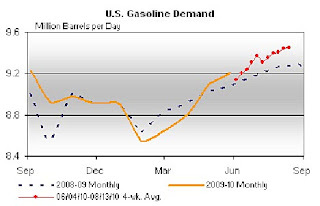 The oil companies can see the event coming, however since it occurs every year, and so the refineries are lowering demand for the season. 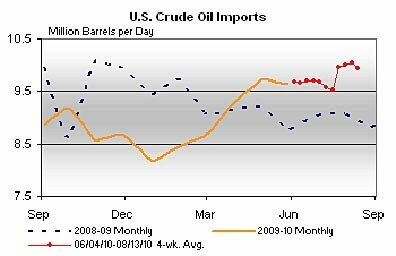 Which, given that domestic production continues relatively constant (but up around 200,000 bd over last year, at 5.4 mbd) means that there is a slight decline in imports. Though it should be noted that these are still running about 0.75 mbd above last year. 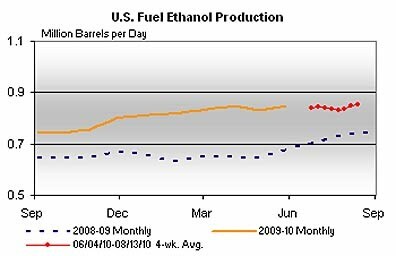 At the same time ethanol (which I haven’t tracked before so am less sure of the seasonal trends) continues at about 0.85 mbd. Initially, the change to ULSD for heating oil may limit import supply sources, as many parts of the world do not produce ultra low sulfur distillate fuels. 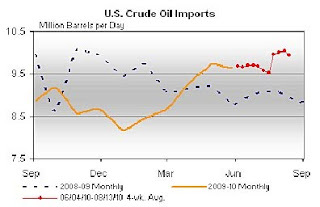 During the winter (December through February), high sulfur distillate imports into the East Coast account for about 20 percent of this region’s total heating oil demand on average, and about 50 percent of distillate imports. Furthermore, during past cold snaps when supplies run short, high sulfur imports have provided most of the relief to the increased heating oil demand. The transition will present other challenges. 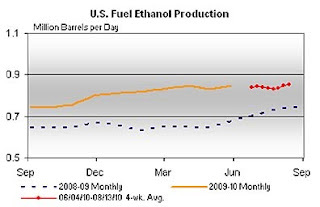 Some refineries supplying the Northeast with heating oil will need to make investments to produce ultra low sulfur distillate fuel for this market. Terminal transitions to low sulfur heating oil will need to be made, as well as changes to supplies of low sulfur additives or blending components to create winter-blend heating oil. 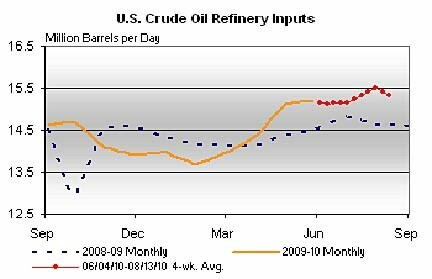 Given that the world's supply is increasingly sour this will only make the problem worse, and will further mandate changes in refineries to cope with the change in demand, without which a bottleneck may develop within the system of supply.